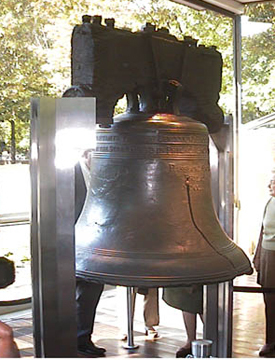 Over the years the Liberty Bell has been rung on many occasions. On July 8, 1776 it was rung at the first public reading of the Declaration of Independence, which concludes, “…. with a firm reliance on the protection of Divine Providence, we mutually pledge to each other our lives, our fortunes, and our sacred honor.” It was later rung when the Constitution was ratified. The Liberty Bell cracked in 1835 while being rung to mark the passing of Chief Justice John Marshall. In 1848 when the Bell was rung to celebrate Washington’s birthday, an extension of the old crack appeared. After this the Bell was no longer rung, but it has been struck with a rubber mallet on special occasions. On June 6, 1944, on D-Day, it was tapped 12 times for the letters in Independence, then 7 times for the letters in Liberty. Today the Liberty Bell is permanently displayed in Philadelphia across from Independence Hall in a pavilion where people can view this shrine of freedom.